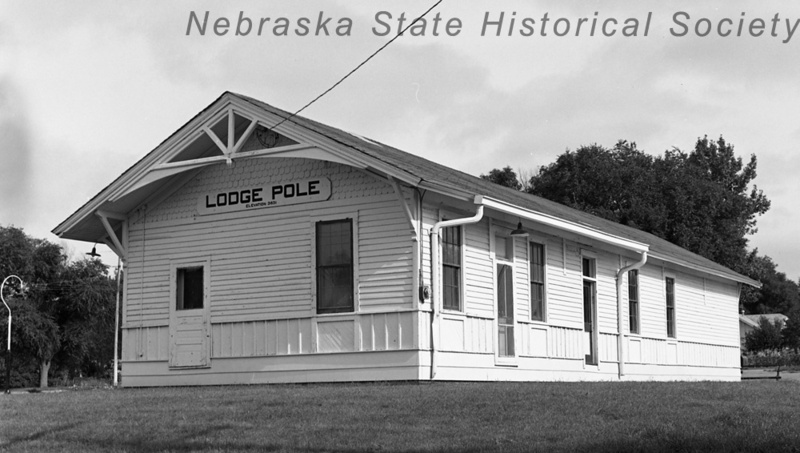 The history of Lodgepole has been closely associated with railroad development and overland travel in western Nebraska. It was originally established as a station when the Union Pacific Railroad was completed to this point in 1867. A company of U.S. soldiers from nearby Sidney Barracks camped here to guard the railroad against Indian attack, and during the early 1860's a Pony Express Station was located a few miles to the east. Lodgepole derives its name from Lodgepole Creek where Indians reportedly secured timber for their tipi poles. Little permanent settlement occurred until the early 1880's, and the town was platted in 1884. By 1886 it had a population of about 200 people. Stock raising was an important early industry, and many of the state's pioneer ranches were located in the region. This depot was constructed by the Union Pacific Railroad in 1887 on a site adjacent to the tracks. It replaced an earlier section house and was in use until 1968. In 1971 a gift from Mrs. Doris Bates Rowan in memory of her parents, Mr. and Mrs. B. J. Bates, made possible its preservation at this location, where it now serves as the Lodgepole Depot Museum. “Lodgepole and the Union Pacific Railroad,” Explore Nebraska History, accessed April 18, 2019, https://mynehistory.com/items/show/73.